The popular refrain among television pundits giving viewers advice about life insurance is always to “buy term and invest the difference”. “Whole life insurance is a ripoff!” they shout. But is this really good advice for everyone? Read on and LifeAnt will cut through the noise and help you to understand if a term life insurance policy really is a better choice than whole life or other cash value life policy. For those of you who don’t know what “buy term and invest the difference” means, this saying refers to saving the difference in cost between a whole life policy and a term policy and investing it in the stock market. The theory is that an investment portfolio will produce higher returns for the owner than a whole life policy over the long term, making term the smarter choice. For the vast majority of people, yes, purchasing a term life insurance policy instead of a cash value policy is a smarter choice. Term is far more affordable, most people do not need life insurance coverage to last past retirement age, and by investing money in other places such as the stock market people will end up with a much higher return on their investment than they will with a whole life policy. Whole life insurance offers very distinct advantages for certain people, mostly those with a lot of money who need an insurance policy to be in place when they die to help facilitate a tax-efficient transfer of their estate to their heirs. Whole life insurance also offers a diversified and (relative to equity markets) very safe investment and retirement savings vehicle for people who already have a lot of assets in traditional places such as a 401k and Roth IRA. LifeAnt recommends that you review the savings of a term life insurance policy and consider carefully if a term or a whole life policy is a better fit for your needs. Is Term Or Whole Life Better For You? The biggest argument in favor of term life insurance is the cost. Term is cheap. A term life insurance policy may cost an owner as little as about 1/10 the cost of a whole life policy with the same death benefit. For most people, there is not a lot of extra spending cushion in their budget. A whole life insurance policy for these people may take a substantial financial commitment, possibly costing more money than they really have available or that practically speaking they want to spend on life insurance. To protect a family with a $500,000 policy, which for the majority of families may be more than enough coverage, will cost a healthy person in their middle 30s less than $40 per month, even for a 30-year level term policy. The phrase “level term” refers to the fact that the cost is the same every year for the entire duration of the guaranteed portion of the policy. For less than the cost of a cell phone bill, most people can purchase ample life insurance coverage with term. Term life insurance is supposed to expire before you pass away, and for most people that is a good thing. This is a big part of the reason term life insurance is so inexpensive compared to whole life insurance. Term insurance can provide coverage while people depend upon the insured person’s income and support, but for people who live until their retirement, chances are they either accumulated enough savings already to support their spouse and/or their children are grown and no longer need parental guardian financial support. Many experts suggest that people only own life insurance until they reach their retirement age because after this point they would not earn any more money while living. Hypothetically, even if they are married the other spouse should be able to survive on the existing retirement savings, as they would be if both spouses were still alive. Whole life insurance is very beneficial for passing assets to the next generation, but for most people, this is not a major concern. The minimum threshold for when an estate becomes taxable rises over time and is (as of 2014) 2 million dollars. With proper estate planning, people can pass along even more free of tax. This means that the vast majority of people do not need to worry about having tax difficulty when they pass what assets they have left with at death onto the next generations. A major selling point of whole life insurance and other forms of cash value life insurance is that the policy can be used as a savings or investment vehicle. Term life insurance has no such cash value. When the policy expires it expires worthless. This is not necessarily a bad thing though, because the lack of cash value is a major factor lowering the cost of term which is the crux of the “buy term and invest the difference” argument. The cash value of whole life insurance will grow enough, theoretically, to provide a positive return for the owner eventually, all while providing life insurance protection the whole time. The cash value also grows tax-deferred, which can increase the net rate of return for the owner, especially those owners in higher tax brackets. The problem is that most people do not need tax-deferred earnings from a life insurance policy. Most people do not put the maximum allowable contributions in their existing retirement accounts. People can get both more tax-deferred, and more tax-deductible savings simply by putting more money in their 401k or IRA accounts. They can also get more tax-deferred investment savings by putting money in a Roth IRA. Most people do not make enough money to contribute the maximum to their retirement accounts, and still have the need for a long term non-qualified (albeit tax-deferred) savings and investment vehicle like whole life insurance. This is not to say that some people do not choose whole life insurance simply for the security and lack of volatility that a policy from a financially sound company will bring, but for most people, there are higher returning (in the long run) options available to save money. Purchasing a term life policy instead of a whole life insurance policy will save the owner a lot of money every year that would otherwise be spent on the whole life insurance premiums. Since this amount of premium savings presumably is available for the owner to invest in other ways, the recommendation is to save the money to retirement accounts, or if those contributions are maxed out to save the money to a non-qualified investment account. A whole life insurance policy will usually return somewhere around 3%-5% for the policy owner in the long run, well below the historical average annual stock market returns of a little over 12%. Even when you take tax considerations into account, at the highest tax brackets the tax savings do not nearly make up for the lower rate of return of whole life insurance compared to equity markets. A whole life insurance policy also may not even provide a positive rate of return until about the 8-10th policy year. To illustrate the difference this makes over a 30 year period, consider the following comparison. This example is based upon an actual whole life illustration with expected dividends and a $4,000 annual premium compared with the cost of purchasing a 30-year level term policy with a $400 premium. These prices are based upon a healthy 35-year-old male. We assume that the man invests $3,600 a year in the retirement investment account, which is the difference between the cost of the whole life policy and the term policy, and he earns an average of 10% per year. 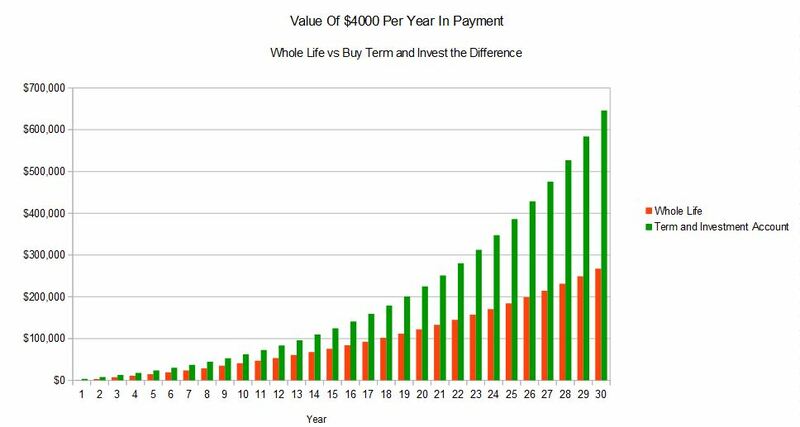 This is the resulting difference in the investment value over time. As you can see the value of the investment account with term protection far outperforms the whole life insurance. This is assuming that the $3,600 is saved to a retirement account, and is growing tax-deferred. Even if it is saved to a non-qualified account, with minimal rebalancing and only long term capital gains tax considerations on those rebalances the term insurance with an investment account scenario still far outperform the whole life insurance considerably. In this example, the 35-year-old will own life insurance until his retirement age, approximately age 65, if he purchases the 30-year level term policy. This is the age that most people will no longer need an insurance policy. It should be clear from this example that if one does not need life insurance coverage for one’s whole life, purchasing term insurance and investing the difference does produce a much higher expected rate of return. Whole life insurance coverage does not expire so in a sense one will never lose the money one pays in like with term insurance. Whole life will be there no matter how old someone is when they die, and this makes it a preferred vehicle for passing assets to the next generation in a tax efficient manner. When managed properly, life insurance benefits are paid tax-free to beneficiaries. This means that if an estate includes a large amount of cash, it is more efficient to pay the money into a whole life insurance policy and to pass the policy proceeds on to the next generation. Even if the estate does not include cash, if it includes non-liquid assets or assets that are difficult to divide among heirs equally, life insurance can help balance out the amount paid to each person and prevent anyone from needing to sell a non-liquid asset such as a house to pay the estate taxes. Whole life insurance certainly has a place for people passing assets on to the next generation efficiently. As previously discussed this is not an advantage for everyone. However, after high-income individuals and families have contributed the maximum amount to their retirement accounts, whole life insurance offers a diversified, safe, and tax-deferred investment choice. Whole life insurance is considered an extremely safe place to hold money, especially if it is from a company with a top financial rating. To check financial ratings go to A.M. Best, which is an agency whose ratings are considered the standard for the industry. The stock market may return a higher expected amount over time, but it is volatile. Whole life insurance is predictable and dependable, and large amounts of money can be saved in a policy. There are no limits beyond MEC and guideline premium rules for the amount that can be paid into a policy. Dividend payments can be an extremely useful advantage of whole life insurance that term life does not have. If interest rates rise, dividend payments will most likely adjust upward over time as well. These dividend payments can be used to pay premiums or to purchase more paid-up life insurance. If they are used to pay premiums, often times the dividend payment will eventually grow large enough to pay the entire policy premium. This means that many people will not actually have to pay into their whole life policy after a certain point, the policy will pay for itself. Dividends can also be used to purchase more paid-up insurance. This insurance is purchased without underwriting or additional annual cost. This ability means the whole life insurance death benefit can increase over time, which may correspond with an owner’s needs. So Which Type Is Better, Whole Life or Term? Despite what television pundits and “experts” may have you believe, the answer is not so simple. It depends on each particular case and each person’s particular needs. For the vast majority of people, purchasing a level term policy and investing the difference between that and a whole life policy’s cost is the better choice. For some people, the advantages of whole life make it the only viable choice. If you would like to compare rates between the two, LifeAnt will help.